Sandra Schmirler was Skip for arguably THE dominant rink in women’s curling during the 1990s; her crowning achievement was winning the first gold medal for women’s curling at the 1998 Nagano Olympics. Through recognition of her performances, she also raised the profile of women’s curling at the national and international levels. She was born in Biggar, Saskatchewan in 1963, the youngest of three daughters of Art and Shirley Schmirler. Growing up, and attending Biggar Composite School, she excelled academically as well as athletically, participating in swimming, volleyball, fastball, badminton, and track. It was curling, however, which she played from the age of twelve at the Biggar Curling Club, which emerged as her favourite sport - she would play on two provincial championship teams while in high school. Sandra went on to study physical education at the University of Saskatchewan in Saskatoon. During her last two years there, she curled on the Carol Davis rink. After graduating, she began curling as third with Kathy Fahlman. It was on this team that she met Jan Betker, who would become a close friend and life-long curling partner. After a disappointing performance at the 1990 provincial championships, Sandra decided to form her own team. In addition to Betker at Third, she recruited Marcia Gudereit and Joan McCusker as Lead and Second respectively. This team won six provincial championships during the decade, and three Canadian championships, in 1993, 1994 and 1997. The team would go on to win the world championship in each of those years, a feat which at that time was unprecedented. No women’s team composed of the same four members had ever won more than one world title. The Schmirler rink followed its performance at the 1997 Worlds with a win at the Canadian Olympic Curling Trials, earning the right to represent Canada in curling’s Olympic debut at the 1998 Nagano Games. The team proceeded through the round-robin tournament with a first-place record of 6-1; it went on to win the gold medal, to the elation of curling fans across the country. For its accomplishments, the rink was named 1998 Team of the Year by the Canadian Press. The four women were also inducted into the Canadian Curling Hall of Fame in March of 1999. # - Record at CDN Mixed, NOT Provincials. Thanks to Brian McCusker for supplying these stats. * - Record at STOH, NOT Provincials. Thanks to Jan Betker for supplying these stats. Sandra also charmed fans with her down-to-earth attitude, and the importance she placed on family and friends. While at the Olympics she talked as much about her daughter and husband as she did about her curling performances, expressing her regret at being separated from them for such a long period of time. She and the other team members often cited their close friendship as a major reason for their success. She also maintained close connections with her hometown curling club; many junior teams there name her as an inspiration for their own efforts. 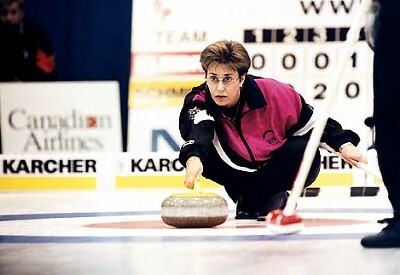 Unfortunately, Sandra’s curling career was cut short when she was diagnosed with cancer in the summer of 1999. She made her last public appearance as a commentator at the Canadian Junior Curling Championships, just three weeks before her death on March 2, 2000. Tributes to her appeared in newspapers across the country, from sports writers and public figures alike. Her hometown of Biggar plans to dedicate a memorial park in her honour. Click here to check out SLAM! Sports' "Sandra Schmirler" Tribute section.